The story opens with Dr. Kirk Langstrom falling prey to a dart in the back of the neck. The attacker remains in shadow. Elsewhere, Bruce attends an event at which Langstrom’s wife Dr. Francine Langstrom is accepting a science award on Kirk’s behalf. Suddenly, Man-bat is spotted outside. Bruce quickly changes to Batman and gives pursuit, but Man-Bat gets away. Francine and Batman return to Kirk’s lab, and find Kirk unconscious and half-naked, with a (bat-shaped) hole in the window. In jail, Kirk is visited by Dr. Stefan Parry. Moments later, Man-Bat escapes with Parry in tow. Later, Kirk awakens at Stefan’s home. Stefan says he wants to help Kirk remove the Man-Bat mutagen from Kirk’s blood permanently. Later, Batman confronts Stefan in the house. Parry admits he drugged Kirk, rendering Kirk unconscious. Parry was using the mutagen to turn himself into Man-Bat. Now with Kirk seemingly on the run, Stefan can operate as Man-Bat with impunity. Francine arrives as Stefan turns into Man-Bat. 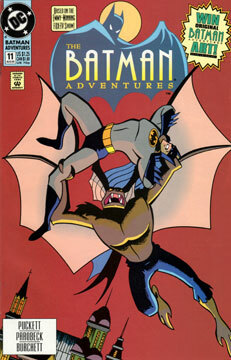 Stefan and Batman tussle, until Batman injects Stefan with the antidote. This issue is another fine example of Puckett’s command of the DC animated universe. The only drawback is that it was too short, and that’s a product of the issue length. I would have enjoyed the reveal of Parry as Man-Bat more had it been allowed more time to boil and bubble. But that can’t be helped. More greatness from Parobeck. As always, his background characters mesmerize me. Check out the lady talking to Bruce at the science award event. She’s bursting with character, yet this nameless woman is only around for two panels. Yes, but only if you’re already buying something else.